It is with sadness that we record the death of Miles Kirton Quest on 24 September 2018. 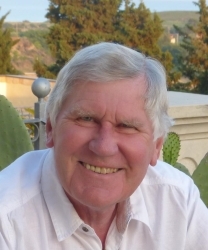 His funeral took place on Thursday 4 October 2018 at the Chilterns Crematorium, Amersham, Bucks, and afterwards at The Greyhound Inn, High Street, Chalfont St. Peter, SL9 9RA. It was on 27th August 1937 in Newport, Gwent that Albert and Edith Quest welcomed their second son Miles into the world, a younger brother to John. On reaching the age of ten, Miles started out at the Prep. School before moving up to the senior school two years later. Although by then his mother was already running The Residence Hotel in Broad Street…..you can see where this is going!......Miles started out as a boarder in the Old Deanery before eventually transferring to West House as a dayboy. Edith also bred golden retrievers which might explain Miles’ love for Diane’s sister and brother-in-law’s dogs, Nemo and Harvey years later. Miles’ brother John, also an OH (1944 – 1952) had since emigrated to Canada where his nephew and niece, David and Sharon and their families still live. Miles’ love of the water and boats started early. The boys and Albert converted a 30ft lifeboat of the RMS Orbita into a four berth, two cabin and central wheelhouse cruiser they called the “John Miles” which they sailed down the river at Tewkesbury and through Strensham Lock. She was an immense feat of carpentry and ingenuity with the lead paint having been bought as HM Government surplus after the war. The boys had to stir it for hours in the rusty tins before it could be used. Eventually she was sold and Albert and Edith bought a smaller, purpose built little cruiser before moving to Marlow and mooring their 20 footer at Bourne End. Miles’ middle name, Kirton was the maiden name of Miles’ Great Great Grandmother, Sarah Kirton. His Great Grandfather, William Kirton Quest, has the same middle name and was the one who moved in 1871 from Hull to Wales. Miles studied hotel management at Battersea College of Technology and lived at Toc H. He graduated with the MHCIMA diploma and took up a post at the Grill Room in the Westbury Hotel. He hated it (!) so, to escape the boredom, Miles started writing for industry magazines. NB> There must have always been a journalist waiting to emerge! Even at HCS he was a keen writer, becoming joint editor of the school magazine. Miles met and married Wendy and together they had two children, Katie and Stephen. Boats continued to run through Miles’ life. There are photos of Wendy on holiday on one of Edith and Albert’s later boats while she was expecting Katie, plus photos of Katie as a very young child aboard the boat complete with life jacket. In the early 1970s Miles and Wendy separated and he moved to Watlington, later marrying Sue. When Katie and Stephen visited, they would often go to the river to see the boats, but the children also remember going to visit the lions at Longleat, which as youngsters seemed very exotic at the time. In 1968 Miles became editor of “Catering Times” – a position he held until 1981 when he left to start Wordsmith & Company with Alan Sutton and Diane Needham. She later became his third wife. Those characteristics, so evident in his professional career were woven through his whole life. He kept in touch with Wendy over the years and he never failed to ask after her and even extended members of the family he hadn’t seen for decades, all of whom still have warm memories of him. Miles continued to love the water. His daughter Katie says she remembers Miles watching her gig racing - standing valiantly on the shore in the freezing wind in Wivenhoe, waving as she rowed past with her teammates. All through Miles’ life he loved art and books. Diane and Miles’ home is filled with books and there are paintings everywhere. Miles was a voracious reader and collector of art. He liked to relax in art galleries and visiting National Trust properties or churches but his “I’m just going to bake a cake to relax” became a family legend in the Quest household! In reality he was very rarely not working, or at least writing. Miles’ skills in the kitchen were not confined to baking, for he was an excellent cook. Diane said that she is not looking forward to having to learn to cook again! They worked and lived together for 29 years before marrying in April 2015 and had a very close, happy and enduring relationship. In September of 2015 Miles was sadly diagnosed with cancer and had been receiving treatment ever since. However, he continued to work, completing his fourth revision of ‘How to Buy and Manage Your Own Hotel’, in conjunction with Peter Nannestad. He also finished co-writing “Service on a Plate”, The Story of Contract Catering with Jim Cartwright in December 2015. Even through his illness he still wanted to remain sociable and continued to go out and see people, which he carried on doing right to the end. Katie remembers one of her last conversations with Miles was about boats. They talked about how she might buy a small wooden dinghy with a friend, and then reminded themselves of the Arthur Ransome ‘Swallows and Amazons’, Norfolk Broads books which were always a firm favourite at home. Miles was always very proud of the achievements of his children, Katie and Stephen and was the fond grandfather of four boys - Hugo, Lawrence, Zephyr?and Celeste. With Diane’s support, Miles was able to spend his final few weeks at home. He died peacefully in his own bed with a ray of sunshine beaming across the room and outside, clear blue skies. “Head of West House (1956 to 1957); School Monitor (1956 to 1957); House Monitor (1955 to 1956). Member of Dramatic Society, including Assistant Stage Manager (1956), then Stage Manager (1957). Attended Battersea College of Technology to study Hotel and Catering Management.